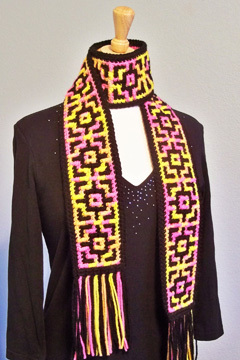 This mosaic scarf is fun to crochet with its striking geometric design! 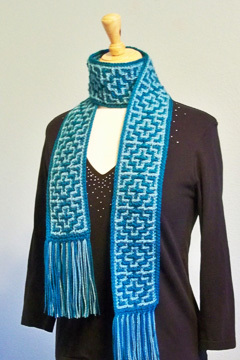 The pattern includes both versions of the scarf: one is made in worsted weight yarn with less rows and the other is made in light weight yarn with more rows. The scarf can be made in the colors shown or any colors of worsted weight or light weight yarn you choose. This scarf is a lot easier to make than it looks, since only one color of yarn is used in each row! A special stitch is introduced with complete instructions and step-by-step photos to work the special stitch. If you already know how to make a chain and a single crochet, and are eager to learn a new stitch, you’re ready to make this scarf! The pattern is easy to follow and includes full instructions for making both versions of the scarf. It also includes step-by-step photos for working in the back bump of the foundation chain, working the special stitch and adding the fringe. There are in-progress photos of each row (in the scarf with more rows), showing you how each row should look after working it, so you’ll be assured that you’re working your rows correctly! Bonus: There are no tails to weave in on this scarf, since the tails are added into the fringe! Don’t we all LOVE not having to weave in tails? The pattern also includes a chart for each of the scarves, if you prefer working from a chart! Note: Photographed model made with Caron Simply Soft Light in #9 Hawaiian Sky and #7 Capri. For 56” length, approx 155 yds/1.4 oz (40 g) of Hawaiian Sky and 135 yds/1.25 oz (34 g) of Capri was used. Note: Photographed model made with Patons Classic Wool Worsted in #226 Black and #201 Winter White. For 55” length, approx 135 yds/2.25 oz (65 g) of Black and 105 yds/1.75 oz (50 g) of Winter White (hand dyed yellow/orange/pink) was used.